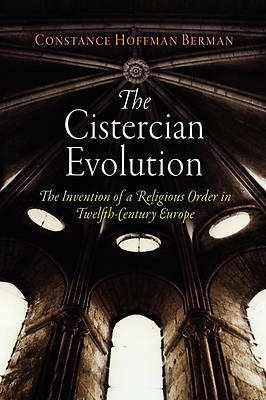 The Cistercian Evolution The Invention of a Religious Order in Twelfth-Century Europe Constance Hoffman Berman "An extremely important book, one that will redefine the ways we conceive of medieval religiosity and politics." --Virginia Quarterly Review "A significant contribution to the study of the history of monasticism in the twelfth century." --EHR "Stimulating, controversial, and compelling, Constance Berman's major revisions of early Cistercian history, The Cistercian Evolution, should be read by historians of monasticism and will greatly interest scholars in the institutional and religious history of the twelfth century as well as those who study the experience of women in that period." --The Medieval Review "An important and provocative book: important because it challenges scholars to rethink a central medieval theme, the creation and expansion of the Cistercian order in twelfth-century Europe; provocative because it brazenly upends received narratives, two generations of accumulated monastic scholarship." --Speculum "This important work builds on and continues Berman's solid, indeed splendid, scholarship on the institutional history of the Cistercians in southern France. She explores and rejects much traditional thinking in fields as diverse as the supposed uniformity of Cistercian architecture and the propagation of the order through colonization or 'apostolic foundation, ' pointing out that much Cistercian expansion was by incorporation of existing communities." --Church History " Berman's] book changes our understanding of the early Cistercians. It will shape our research for some time to come. Berman's questioning of Cistercian documents, her new picture of Cistercian growth, her warnings about reading thirteenth-century administrative structures and ideas back on to the twelfth, and especially, her insistence that we consider houses of both men and women, make this book an important contribution to the history of religious institutions in the central Middle Ages." --The Catholic Historical Review For centuries the growth of the Cistercian order has been presented as a spontaneous spirituality that swept western Europe through the power of the first house at Citeaux. Berman suggests instead that the creation of the religious order was a collaborative activity, less driven by centralized institutions; its formation was intended to solve practical problems about monastic administration. With the publication of The Cistercian Evolution, for the first time the mechanisms are revealed by which the monks of Citeaux reshaped fact to build and administer one of the most powerful and influential religious orders of the Middle Ages. Constance Hoffman Berman is Professor of History at the University of Iowa and the 1999 May Brodbeck Fellow in the Humanities. The Middle Ages Series 2000 408 pages 6 x 9 ISBN 978-0-8122-2102-2 Paper $26.50s 17.50 World Rights History, Religion Short copy: Reveals the true story behind the growth of the Cistercian order."